How do you make choices – from the head or heart? During my launch this month for Absolutely You I have been focusing a lot on my personal branding work, Brand from the Heart. I’ve had some amazing VIP days and coaching sessions with clients helping them make clear decisions that align their brand with their inner guidance and higher purpose by helping them sense the difference between decisions that are being made by the head or the heart. Following your purpose is about doing what lights you up, following your passion and doing the work that only you can do that makes a difference in the world. This could be as a business owner, but it certainly doesn’t have to be. All you need is a willingness to explore yourself and the unique role you are here to play. I thought that practising some of this inner work would make for a really fab session at The Aphrodite Club. The heart has vast intelligence and is connected to your spirit and your higher purpose. Your mind is analytical and a great tool for problem solving and considering options. We’ll be looking at how to ask powerful questions that use both of these powerful resources to take you closer to your goals, and practice how to sense whether the answers you receive come from the head or the heart. Did you know that your finger prints start developing in the womb 3 months after conception? Your uniqueness, life purpose, gifts, challenges and opportunities that you are here to experience and learn from are written into the fabric of your being. You and your life experiences are not random. There is a divine purpose for each of us. To explain this in her own fabulous way we’ve also got the gorgeous Helen Elizabeth Evans coming to speak about her work as a scientific hand and finger print analyst. You can uncover your true life purpose, authentically, by reading the dermatoglyphs (fingerprint patterns) on your hands. The results are amazing. Having done Helen’s workshop I am clearer about my main drivers and the challenges and opportunities that usually show up in my life to help me grow. It was fascinating and spookily accurate that my hands revealed a map to my best life and absolutely confirmed that I am on track which has really boosted my confidence! 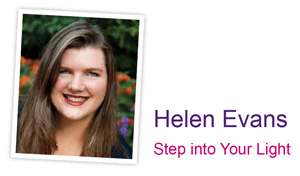 Helen’s a fabulous speaker so you don’t want to miss this fun packed session!